Fri., March 10, 2017, 11:11 p.m.
KANSAS CITY, Mo. – Monte Morris helped Iowa State win a pair of Big 12 Tournament titles under Fred Hoiberg. Now he has a chance to do it under Steve Prohm. The all-Big 12 guard had 15 points, Deonte Burton scored a game-high 22, and the pair of seniors guided the No. 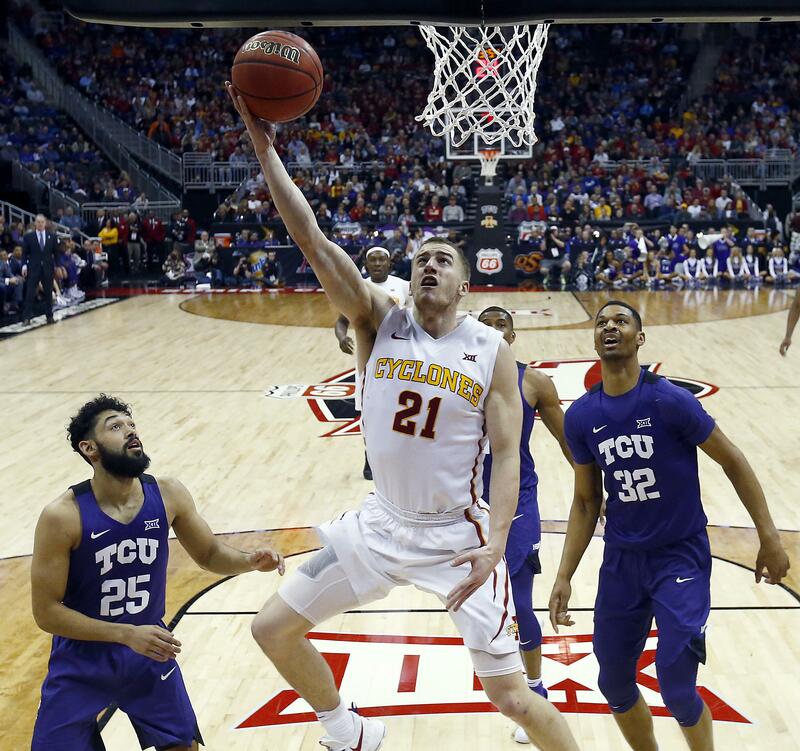 23 Cyclones to an 84-63 rout of upstart TCU on Friday night, moving the program into the tournament title game for the third time in the past four seasons. The last two times, the Cyclones succeeded in hoisting a trophy on Saturday night. The fourth-seeded Cyclones (22-10) clearly weren’t impressed – or intimidated – by the Horned Frogs’ victory against top-ranked Kansas in the quarterfinals. Iowa State used two big first-half runs to assume control, and then stretched its advantage to 26 points midway through the second. That gave Prohm’s group, which has won eight of its last nine, plenty of time to rest for Saturday night’s title game against No. 11 West Virginia. The Mountaineers survived to beat Kansas State 51-50 in the other semifinal. Vladimir Brodziansky and Jaylen Fisher had 10 points apiece for the No. 8 seed Horned Frogs (19-15), but nobody seemed to have much pep in their step after their heart-stopping win over the Jayhawks. The great irony of the 85-82 upset is it turned TCU’s semifinal into a road game. Thousands of Iowa State fans hopped on I-35 and headed south when the Cyclones beat Oklahoma State and the Jayhawks were eliminated, snapping up extra tickets from despondent Kansas fans. The result? TCU might as well have been playing at Hilton Coliseum. Early on, the Horned Frogs matched the Cyclones basket for basket, trying their best to take the crowd out of the game. They even led in the opening minutes, before Iowa State started to pull away. Burton got things going with his versatile inside-outside scoring ability, and Morris began to build on his near-triple-double in Thursday’s win over the Cowboys. And by the time they spearheaded runs of 10-0 and 10-2, they had given the Cyclones a comfortable lead. Burton capped his big first half with a nifty wraparound pass to Solomon Young, whose easy lay-in at the buzzer gave the 2014 and ‘15 tournament champs a 44-27 halftime advantage. Burton added three more baskets out of the locker room, his second 3-pointer of the game pushing the lead past 20, as Iowa State fans began to rise from their seats whenever he touched the ball. The Horned Frogs’ heavy legs began to show by that point, the toll of an opening-round win over Oklahoma and their upset of Kansas leaving them weary by their third game in three days. Iowa State has hit 12 3-pointers in each of its Big 12 Tournament games. … The Cyclones only committed six turnovers. … Young finished with nine points, nine boards and four blocks. … TCU’s Kenrich Williams had nine points, eight rebounds and five assists. TCU’s win over Kansas got it into NCAA Tournament discussion, but it probably wasn’t enough to overcome seven straight losses to close the regular season. The Horned Frogs last made the field in 1998 and last won a game there in 1987, when Dixon was a player. Iowa State has turned the Big 12 Tournament into a personal party, going 9-2 over the past four seasons. The Cyclones have never lost in three championship appearances. TCU waits to see what postseason tournament invitation rolls its way. Iowa State gets ready for Saturday night’s title game. Published: March 10, 2017, 11:11 p.m.